The “Backup and Restore” module serves three functions. The first is to clean up any unwanted data, the second is to backup the database and provide full data extracts, and the third is functionality to restore the database from standard Brimbox backup files. As noted in the Set Layout Names and Set Column Names module documentation removing a layout or column does not delete the underlying data. Here that functionality is provided. There is also the Backup Database button which saves the whole database encrypted or unencrypted to a local file. These functions require the admin password of the current user be provided, and the encrypted backup file will require the same admin password be provided to restore the database. The second area allows full tab delimited data extracts of each layout to be taken from the database, again requiring the current admin password. It also allows the list data to be extracted. Finally there is a restore database area for restoring the database from a Brimbox backup file (bbdb file). This area allows specific Brimbox tables to be restored, and has a button for rebuilding the search indexes which does not happen automatically. The Backup and Restore module is only available to administrators and can be selected from the Backup and Restore button on the left of the Admin tab. The first three buttons are used for cleaning up the database. The first button, “Clean Database Data”, will trim all data and remove any unwanted characters, such as tabs, from the database. This button follows Brimbox Character Policy, and data inputted from the “Input” or “Upload Data” modules should never need cleaning. “Clean Database Columns” will clean up data in any unused columns, as defined in module “Set Column Names“. “Clean Database Layouts” will delete rows from unused layouts, as defined in module “Set Layout Names“. 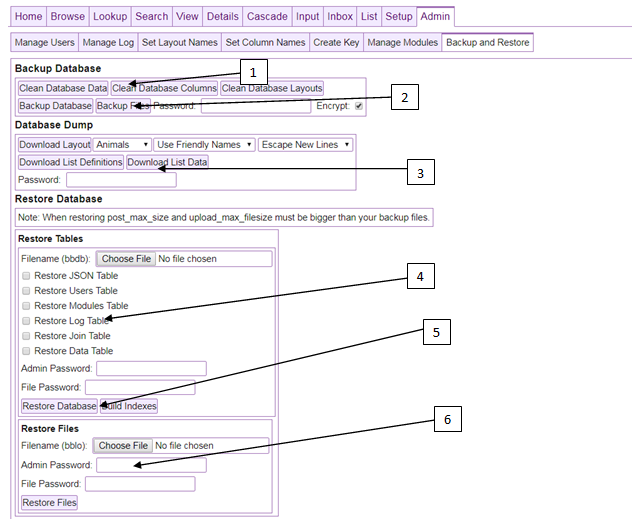 The “Backup Database” button backs up the database in a line file form. If encrypted is checked the data will be compressed, encrypted, and then put in base64. If not encrypted it will just be compressed and put in base64 lines. The encrypted file will use the admin password as an encryption key, and when restoring from either backup file type Brimbox will require the admin password be used when backing up. The “Backup Files” option is similar. It backs up the files stored in the Postgres large object store into line format, either encrypted or not. The “Database Dump” area is for taking data extracts. There is a dropdown for choosing the layout to get an extract from, and a dropdown to choose whether to use the Brimbox generic names or the names chosen in Set Columns names. There are also two buttons for extracting the list definitions and data. This allows for easy portability if the administrator wants to take some or all of the data to another platform quickly. The “Restore Database” area allows for the restoration of data from the backup files, provided the administrator has the password associated with the backup file. The administrator should choose the desired backup file, provide the backup password, and choose which tables to restore. Any of the five standard Brimbox tables can be restored, however be careful restoring the users table since admin passwords can change and old users can be brought back. When restoring from backup the data table search indexes are not restored so this button is used to rebuild the full text indexes. The “Restore Files” area allows for the restoration of Postgres large object files from the backup files, provided the administrator has the password associated with the backup file. The administrator should choose the desired backup file, provide the backup password, and choose which tables to restore.